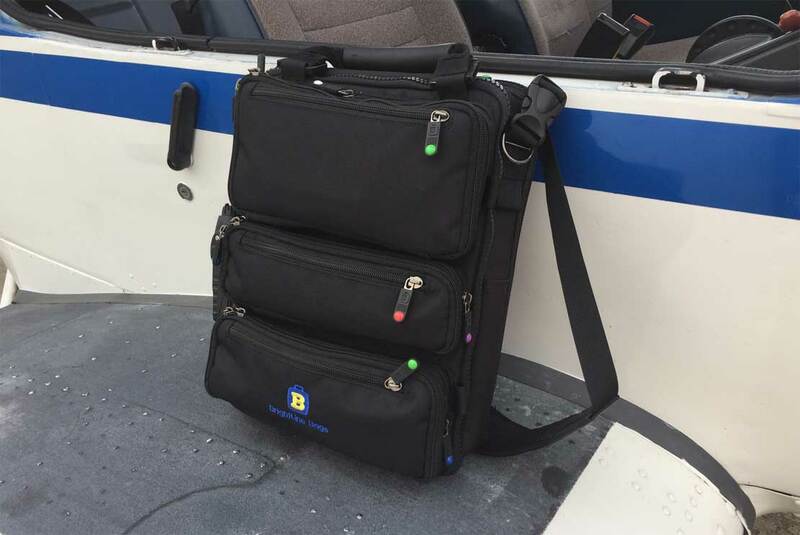 The quest for the perfect flight bag isn’t easy. It’s hard to strike a balance between carrying all the gear you need and lugging around a heavy monstrosity. Part of the problem is that different missions require different amounts of stuff. A local trip around the pattern might only require the bare minimum of equipment. An overnight cross country might require all your flying gear, plus a change of clothes and an extra headset for passengers. Up to now, that’s meant either lugging around a huge gear back all the time, or switching your crap between bags. Either option is a huge pain. When I started instructing, I decided to go for the most minimalist option I could for my gear. Part of that was switching to the ultra-compact QT Halo Headset (you can read that review here). For the last few months, I’ve been flying with a BrightLine bag. And I think I’ve finally found the perfect flight bag. One of the biggest perks of being an instrument rated pilot is being able to grab a pop-up IFR clearance if you need to get yourself out of a sticky situation. Thing is, while most IFR pilots know that a pop-up clearance is part of their bag of tricks, few have ever actually used one. In the video, Jason finds himself stuck on top of a low cloud layer while he and his wife were filming a video for their ground school series. So they took the opportunity to get a pop-up clearance, followed by flying an ILS approach to minimums. It’s a pretty cool real-world example of why it’s a great idea to get an instrument rating — and a good refresher if you’re an instrument-rated pilot who hasn’t given pop-up clearances much thought in a while. Definitely worth a watch! A while back, I posted about four of my favorite aviation channels on YouTube — if you haven’t already checked it out, click here to read it. But in the months since, I’ve stumbled across some other great YouTubers who make videos about flying and airplanes, so I figured I’d make another short list of subscribe-worthy channels. Vlogs have become pretty popular on YouTube in the last year or two, but there aren’t many that focus on flying. Enter CaptMoonbeam, a corporate jet captain who posts a new video every Monday. The private jet world is pretty secretive — some FBOs will throw a hissy fit if you try to film on their ramp — so it’s pretty interesting to see this side of the flying world. Most videos involve flights in a variety of Cessna Citation jets, and the good Captain does a good job of combining flying content with showing what life’s like during trips in his videos. Definitely an entertaining channel. General aviation isn’t just about physically controlling an plane — it’s about the freedom to find adventures. And Ed and Colleen from Good Plane Living have a fantastic channel for anyone that wants to live vicariously through the YouTube lens of a family that does just that. Ed and Colleen own a gorgeous Van’s RV-10 that they recently finished building, and they’ve recently started populating their channel with videos their travels with their son EJ. If you haven’t ever wanted to go camping with an airplane, the video above will change that. And if you haven’t been infatuated with experimental aircraft models, this video will change that too. If you’re working on your private pilot certificate — or just beefing up the stuff you’ve forgotten — you should really check out Private Pilot Study, a free interactive flying study group that meets virtually on a regular basis. The group covers everything from aircraft systems (above) to weather to getting started. Sessions are streamed live on YouTube, with a limited number of slots open for students who want to interact with the instructor(s) on Google Hangouts. It’s a great offering — and again, it’s free. 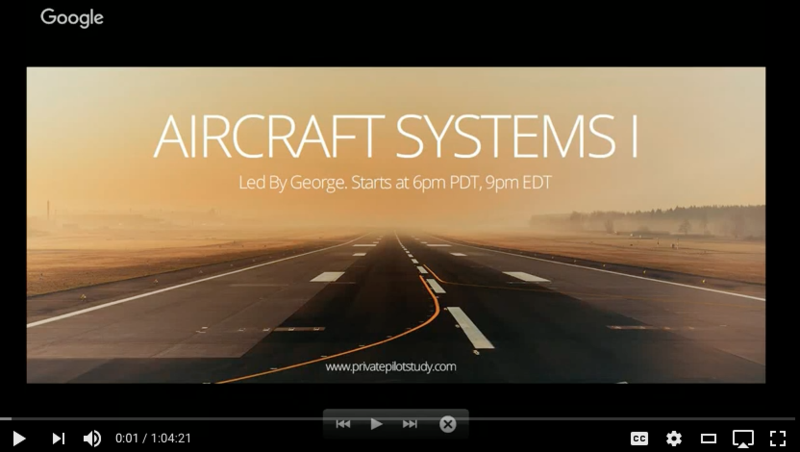 To sign up for the mailing list and get notified of upcoming study sessions, visit PrivatePilotStudy.com. Or watch the archived sessions on their YouTube channel. Leading up to Oshkosh this year, Redbird produced a video series called Winging It that followed the director of their ImagineFlight initiative, Brittney Miculka, on a series of aviation adventures around the country. The series brought Brittney everywhere from tackling the Washington, DC SFRA (#represent) to flying aerobatics with airshow giant Mike Goulian. It’s a fun series to watch — and now that Oshkosh is over, I hope that Redbird brings it back! US Sport Aircraft is a flight school and SportCruiser dealer based in Texas. Recently, they’ve been pumping out a bunch of entertaining (and sometimes cheesy) videos introducing people to flying and tackling questions (like the PTS to ACS transition). Their videos are definitely worth checking out, especially if you’re a student pilot. That’s it for the list — if you haven’t seen it already, remember to check out the first installment of my favorite YouTube pilots right here. And do you have a favorite aviation YouTuber that I missed? Share them in the comments! I’ve spent a while agonizing about what I carry in my flight bag. As happy as I am with my gear, it’s just too big — and not too practical for instructing. The biggest contributor to the bulk? It’s my headset. For the last few years, I’ve been flying with a Lightspeed Zulu.2 headset — you can read the review of that here. It’s a great headset. It’s comfortable, the sound quality is fantastic, it’s got nice extra features like bluetooth, and it cost a pretty penny. All of those facts made me hem and haw quite a bit about even thinking about switching the headset I carry. But ultimately, the prospect of lightening up my gear won out — and I decided to at least try out one of the super lightweight headsets that have hit the market. 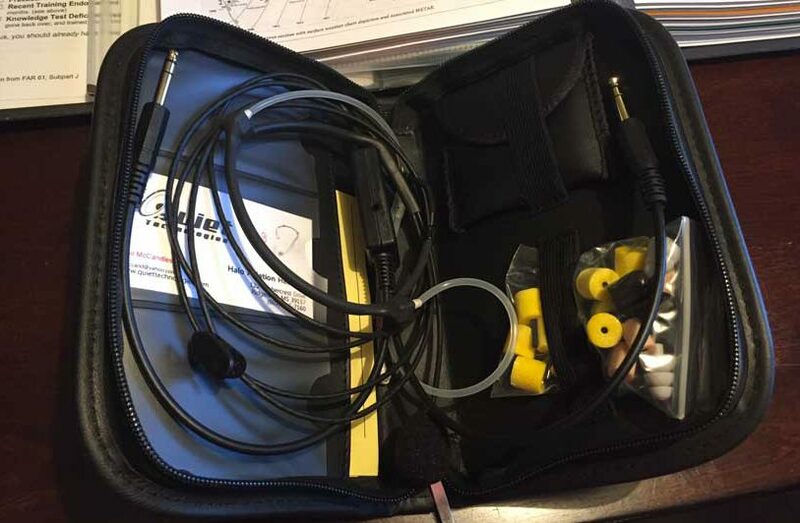 Lightweight, in-ear headsets have become incredibly popular lately, particularly with professional pilots (like CFIs) who switch equipment frequently. A few of the popular contenders include the Quiet Technologies Halo (which we’re talking about today), the Clarity Aloft line, and now the relatively new Faro Air. The Clarity Aloft and Faro offerings are very similar designs — they both use earbuds that go in your ear, with a boom mic that hooks around your head. The QT Halo uses the same microphone setup, but one major difference with the Halo is that the speakers are actually located on the headband — acoustic tubes connect the speaker output to earplugs that actually go in your ears. Because of that, the electronics are quite a bit removed from the threat of sweat, snags, and… earwax. If you snag earbud on the plane door when you’re getting out, and rip it off, you’re looking at a minor $10 fix versus wrecking your brand new headset. That really appealed to me. So did the price. At $359, the Halos are actually cheaper than either of the competing in-ear headset models. Apparently, that appeals to a lot of other people too, because, as of this writing, they’re actually pretty hard to get ahold of. 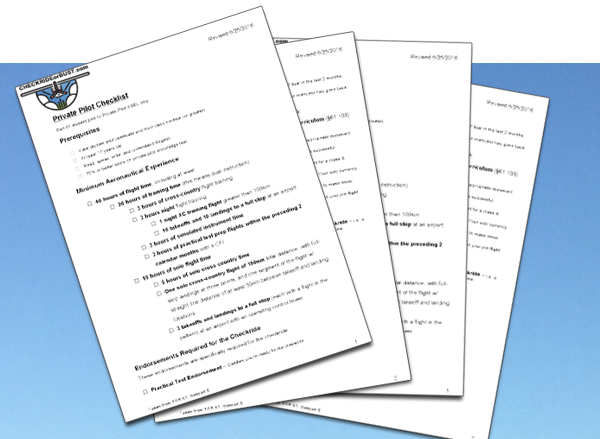 We use checklists to fly planes — why not use checklists to figure out how close you are to achieving your license or rating too? While all of the requirements for the FAA’s certificates and ratings are found in part 61 of the FARs, the raw regulations can be a little hard to parse at times. Plus, it’s cumbersome to pull out your copy of the FAR/AIM if you’re partway through training and trying to figure out how many more “boxes” you need to check off to meet the minimum requirements for your ticket. Besides just the minimum aeronautical experience, I’ve also identified the endorsements you’ll need from your CFI to take the checkride. The FAR references are at the bottom of each checklist. As always, be sure to verify things for yourself to be sure that you’re qualified for the certificate you’re pursuing. Regs (and interpretations) do change. Remember, you’re PIC of your flight training! Disclaimer: While I am a flight instructor, I am not your flight instructor (probably) -- the content on this blog doesn't constitute flight or ground instruction. Instead, it's made up of my thoughts, opinions, and wild guesses. Always be sure to check with your CFI before applying anything you see here in an airplane. Fly safe!